Apple has entered into an alliance with China Mobile Ltd, the world’s biggest telecom carrier by subscriber numbers to sell iPhones in the world’s most populous nation. Apple had earlier refused to redesign its iPhone so that it can work on China Mobile’s self-developed TD-SCDMA 3G networks. China Mobile has a user base of almost 760 million and iPhone sales are expected to soar in China with the deal that would see the new iPhone operate on China Mobile’s network. 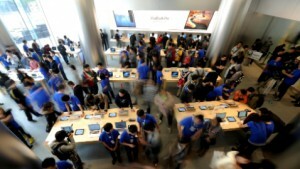 Apple had already sold more than 16.8 million iPhone handsets in China in the 12-month period ended on September 30. China Mobile has announced it will begin taking orders for Apple Inc’s iPhones from December 25. This deal could stem the steep decline of Apple sales in China even as it is losing market share to South Korean Samsung Electronics Co.
Apple just sold 3.4 million units, accounting for 4.3 percent of the market in the same period although Apple now has 11 retail stores in Beijing, Shanghai, Shenzhen, Chengdu and Hong Kong. Apple ranks 6th in China’s smartphone market, facing tough competition from Chinese brands, research firm IDC figures showed in December last year. Earlier in April, facing a barrage of criticism from Chinese media, Apple chief executive Tim Cook had apologised to Chinese consumers over poor customer services. Meanwhile, many Chinese domestic mobile phone manufacturers are moving to catch the 4G smartphone wave. Yulong Technology Co. said it aims to become the top brand in China’s 4G smartphone market. It will launch 30-plus 4G mobile phone models next year. Last week, Yulong unveiled two 4G smartphones. It said the handsets will hit Chinese markets next month, at around 1,000 yuan ($165) per unit.